Just before Labor Day I left Dallas for New Jersey to be on-site for the uncrating and installation of the exhibition Gustav Stickley and the American Arts & Crafts Movement. Organized by the DMA, this exhibition opens at the Newark Museum of Art next week, and as the DMA’s Registrar, it is part of my job to help in the moving of these works to ensure proper handling. It's nice to see a museum being promoted at a sporting event. 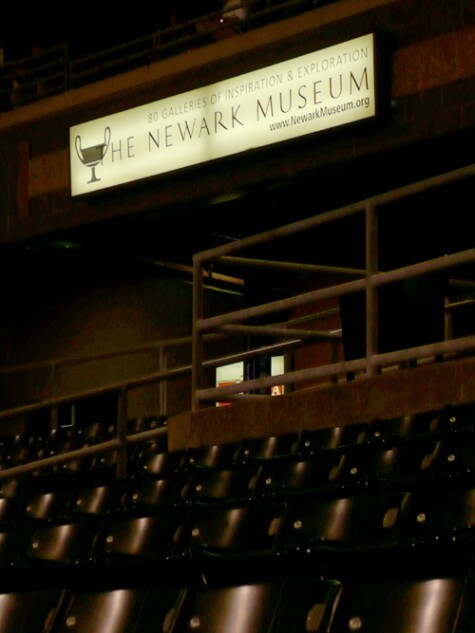 I noticed this sign for the Newark Museum while watching the Newark Bears play the Bridgeport Bluefish. It’s early September and the ideal weather makes this a great evening to catch a minor league baseball game in Newark. After working all day installing the exhibit at the Newark Museum, this is a nice change of pace. Even the annoyingly loud music that plays every time a batter steps up to the plate can’t ruin the great atmosphere. 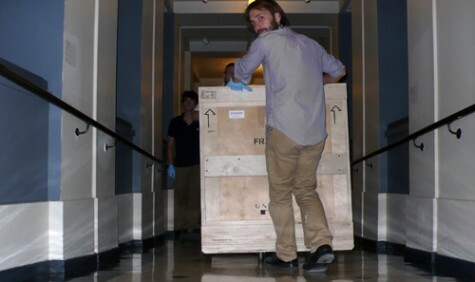 Daniel Brophy makes sure he doesn't run me over as he helps David Bonner and Seth Goodwin move a crate into the galleries for unpacking. It’s proving to be a challenge installing an exhibition at another museum as the opening tour venue–usually the organizing institution opens the show but in this case it premieres in Newark to coincide with the 100th birthday of Stickley’s home, Craftsman Farms, in Parsippany-Troy Hills, New Jersey. But the Newark Museum exhibition team and registrars are working hard to make sure we unpack, condition report (as a registrar, it is also part of my job to carefully document any change in condition or damage that might occur), and install the 100-plus objects before the first opening event on September 14. One of the specific challenges revolves around the fact that this is the first time I’ve seen the majority of the objects in person. This adds to the amount of packing documentation and condition report notes that must be made before the objects can be finally installed. But we’ve worked out an effective system where Newark Museum registrars Antonia Moser and Amber Germano have been completing many of the condition reports while I update packing notes and direct the art handlers (Seth Goodwin, Daniel Brophy, Diane June, and David Bonner) on the order of crate unpacking. It’s vital to keep the unpacking and condition reporting process moving smoothly with as little down time as possible in order to meet our deadline. Newark Museum Associate Registrar Antonia Moser performs a condition report on a folding screen in one of the museum galleries. 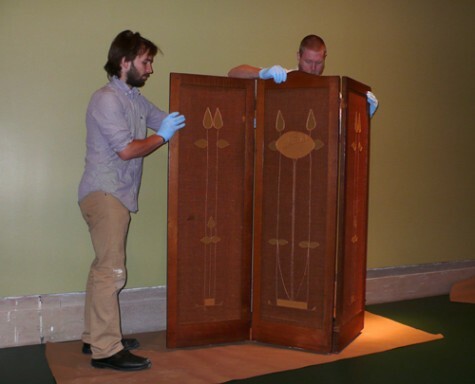 Daniel Brophy and Seth Goodwin install a folding screen after unpacking it. Gloves are required when handling works of art to protect the surface of objects. While crates look like simple wooden boxes on the outside, their interiors can be filled with numerous braces and other packing features to ensure the safety of the artwork while being transported. 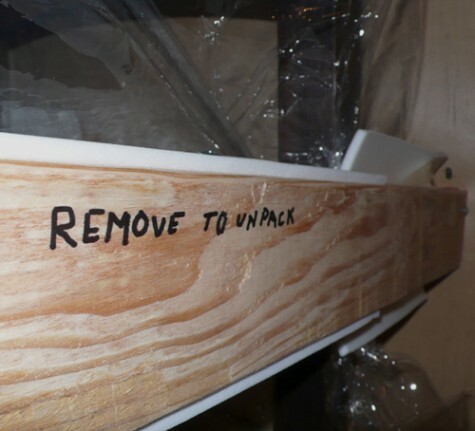 It's vital to follow any instructions provided by the various craters, who often write directions and registration marks directly on the crate and crate components for easy visibility. And while every exhibition installation has its fair share of bumps in the road and unique challenges, it’s what makes my job as a registrar so appealing. There’s not much that beats opening crate after crate of fine art and making sure it’s installed safely for museum visitors to enjoy. And as a bonus, I’ve discovered that Stickley’s ash furniture pieces are quite beautiful. Be sure to check them out if you’re in Newark, Dallas, or San Diego during the exhibition dates in those cities. Oh, and here’s a double bonus: the home team Newark Bears have erased a 4-1 deficit and now lead the Bridgeport Bluefish 7-5 in the bottom of the fourth inning. Go Bears! Brent Mitchell is the Registrar for Loans and Exhibitions at the Dallas Museum of Art.